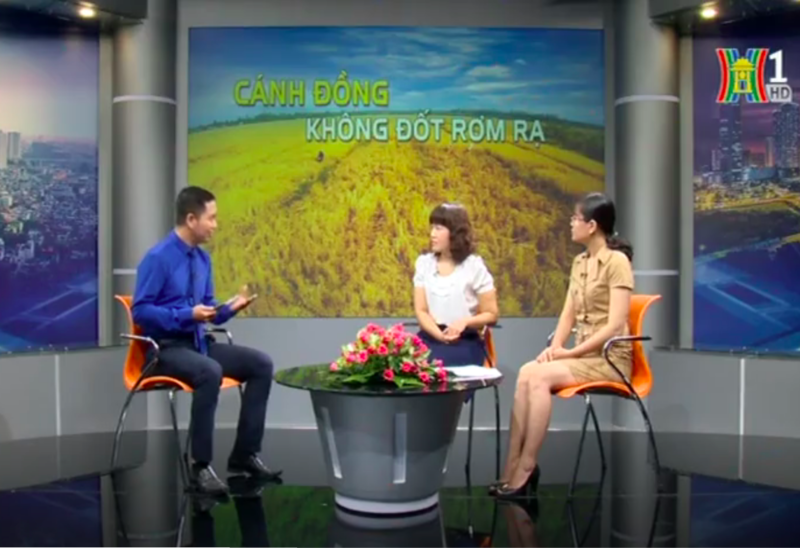 Ms. Tran Thi Hoa, GreenHub’s Director was a guest on the Hanoi Television talk show “No straw burning fields” which aired on Saturday 8 July 2017. Along with Ms. Luu Thanh Chi, Hanoi Environment Protection Agency Deputy Director, the show discussed the impact of straw burning on the air quality issues in Hanoi. Following the rice harvest, farmers burn the residual straw in the fields surrounding Hanoi. Smoke from the burning straw contributes to the poor air quality in Hanoi and can lead to serious health problems including respiratory failure, heart failure, and lung cancer. In response to this situation, the Hanoi Department of Natural Resources and Environment has launched the campaign “Do not burn straw”. The main objective of this campaign is to raise awareness among farmers about the harmful effects of burning straw and to present useful options for the recycling and reuse of straw to improve economic efficiency, and to protect the environment and the health of the people. Farmers are provided guidance into composting the straw residue to create organic fertilizer for use on their fields, using it for animal feed or in mushroom cultivation processes. GreenHub will work with the Hanoi Environment Protection Agency, based on the results of the campaign “No burning Fields,” to further promote initiatives for improving air quality in Hanoi. These initiatives are supported under the program “Clean Air Green City – Building multi-stakeholder network and linkages among youth, communities, businesses, and government to improve air quality in Ha Noi”, coordinated by Live and Learn, with GreenHub, GreenID and Hanoi University of Science and Technology as project implementing partners.